It is not often that you have a book promotion in which four well-known authors would attend together, but this is what has happened in The Coach Room of Dundurn Castle in Hamilton, Ontario. The Different Drummer, an independent bookstore in Burlington, Ontario presented together with Bryan Prince Bookseller and Random House Canada Toronto authors Don Gillmor, Tanis Rideout, Shyam Selvadurai and Ania Szado to read from their latest work. Don Gillmor is a Toronto-based journalist who has won numerous National Magazine Awards. His children’s books have been nominated for the Governor’s General Award and he has written a two-volume history of Canada as well as involved in the production of the television series Canada: A People’s History. This evening he introduced his second novel Mount Pleasant by talking about the 1989 collapse of real estate prices and a life of debt confronted by the main character, Harry Salter, in his book. He read the except in which Harry was being persuaded by his real estate agent to purchase a property well over its value only to discover afterwards the woes of termites, lead pipes and leaking foundations. On top of that he also lost money by investing in an asbestos company. Gillmor wrote and read with a sense of dry humour which delighted his audience. The host introduced Tanis Rideout to be the Poet Laureate of Lake Ontario for her effort in protecting the Niagara Escarpment and the lakes. She has won literary award for her poetry, and Above All Things is her first novel. Rideout then read a poem of hers about the lake before reading from her book. Her prose sounded like poetry and the excerpt she had chosen describing the scene after George Mallory told his wife Ruth that he had been invited to join the Mount Everest expedition team for the first time flew with a lyrical beauty that was both sensual and emotional. Her second passage was a heart-wrenching piece about Mallory’s last moment on his ill-fated final climb. It was equally poetic, but different in style. It almost brought tears to my eyes at the part when Mallory tore a picture of him and Ruth into halves and put away the part of Ruth in his pocket. Sri -Lankan born Shyam Selvadurai’s Funny Boy won the Books in Canada First Novel Award and the Lamda Literary Award for gay male fiction in the U.S. 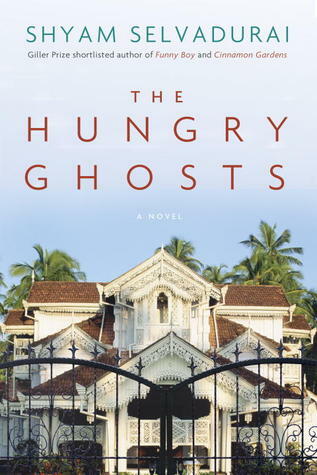 The Hungry Ghosts, his third novel, is the first time he brings into the scene Toronto besides Sri Lanka. Selvadurai talked about the Buddhist theme in his novel before he read with delightful animation Shivan’s meeting his grandmother for the first time when his mother took him and his sister home after the death of his father. The passage was colourful and the world seen through the eyes of young Shivan came to life. Everything felt so real, and this likely was due to the semi-autobiographical nature of the book. Selvadurai is Tamil, and in the passage he read, Shivan joked that if his sister married a Sinhalese, she could change her name forever, with an appealing sarcastic touch. Ania Szado showed the audience the co py of The Little Prince she had kept since she read it as a child and described the inspiration behind the creation of Studio Saint-Ex to have come from reading the autobiography of Antoine de Saint-Exupéry and falling in love with him. She wanted to write about him and did extensive research and interviews into his life. She found that many women also fell in to with the author and were willing to do anything for him. This gave her the incentive to create a woman who also wanted something for herself, hence this ambitious designer from Montreal who wanted to climb in the world of haute couture that was burgeoning in New York–Mignonne LaChapelle was the protagonist. This was also the time when Saint Exupéry wrote The Little Prince. The passage she read was the conversation between Mignonne and Antoine, when he appeared after a period of absence. I was mesmerized by the tension, the intimacy and the unfathomable intent behind the words. There was a questioning period. The authors were asked how long it had taken them to write the novel. For Rideout, it was seven and Szado said that it took her two to three years and longer time in New York and Montreal interviewing people who knew Saint Exupéry. It was also two to three years for Gillmor to write Mount Pleasant. It took longer for Selvadurai– 13 years– who added that he found it easier to write about his home country Sri Lanka than the landscape of Toronto. I certainly can relate to what he was saying, because even though I have lived in Toronto for over twenty years, I also find the words and images come about more easily when I think about the places I have lived earlier in my life, such as Hong Kong and England. Other auhors also talked about the context in which they had created in their novels. Gillmor said that the neighbourhood of Rosedale had not changed and he had a good grasp of the landscape where his character lived. He spoke to long-time residents there about the time he set his novel. He walked a lot in the cemetery at Mount Pleasant. Szado described her experience living in a studio as a fine arts student and that was where she found the context for Mignonne’s studio. Rideout was charmingly honest that she never visited Nepal or came near the Everest–her inspiration of the mountains was drawn from the internet. However, she did not like the cold, and writing about the cold was not a problem for her. It was a rare and totally enchanting evening in the company of these authors who read from their novels some of the most vivid and dramatic moments. When asked about film rights, all the them said that they had been approached—treated with fine dining and great conversation according to Gillmor– and yet nothing had materialized. This certainly gave some insight into the complexity of making a good book into a movie that will sell, let alone do justice to the original work. This entry was posted in Books, Hobbies, Leisure, Reading and tagged Above All Things, Ania Szado, book promotion, Don Gillmor, Mount Pleasant, Shyam Selvadurai, Studio Saint-Ex, Tanis Rideout, The Different Drummer, The Hungry Ghosts on April 30, 2013 by Opalla.